How do you get clothes dry in winter? I’m going to assume that if you’re frugal and have a hills hoist, then you hang your clothes on the line outside. While this does save money, how do you manage when it’s wet, raining or simply too cold for the clothes to dry? And what are the best tips to make sure your clothes dry when there is a little bit of sun? On a traditional clothesline, the best way to dry your clothes is to use the whole clothesline, starting on the line closest to the centre then work your way around. Some people prefer to use one segment (like a triangle), however, the theory is if you hang around the line you have more sun exposure. It may only be a little bit of extra sun, but every little bit counts, right? If you happen to have a sunny day, get as many loads on the line as you can. If your washing machine has a timer, set it to start before you get up e.g if a load takes 1 hour to wash and you rise at 6:00am, set the machine to start at 5:00am. Then as soon as you are up, hang one load and put another on. This way you can get 2 loads washed and out before you leave. Buy portable clothing racks from department stores or similar and hang your clothes inside. If you have the heaters on to warm the place, this means your heaters will be drying your clothes at the same time. Be aware, experts have said this increases the dampness in the home and can lead to mould and dust mite issues if done regularly. Portable racks can easily be moved around the home and if clothes are hung properly, with space, they are dry by morning. String rope or lines up everywhere there’s a cover … and the warmer the area the better (i.e. garage). If you have a patio, covered courtyard, balcony, deck or shed all you need is a hook at either end and some rope. 5 metres of rope will set you back $2. Alternatively, get a clothesline that folds down to place undercover (e.g. garage or balcony) and pop it up when you need to use it. If you’re short on hanging space (particularly with some of the smaller portable racks), hang your clothes on a clothes-hanger. If it’s predicted to rain all week, do small amounts of washing every day, rather than letting it all pileup. It’s easier to spread out your clothes racks in smaller batches. Wear things longer. 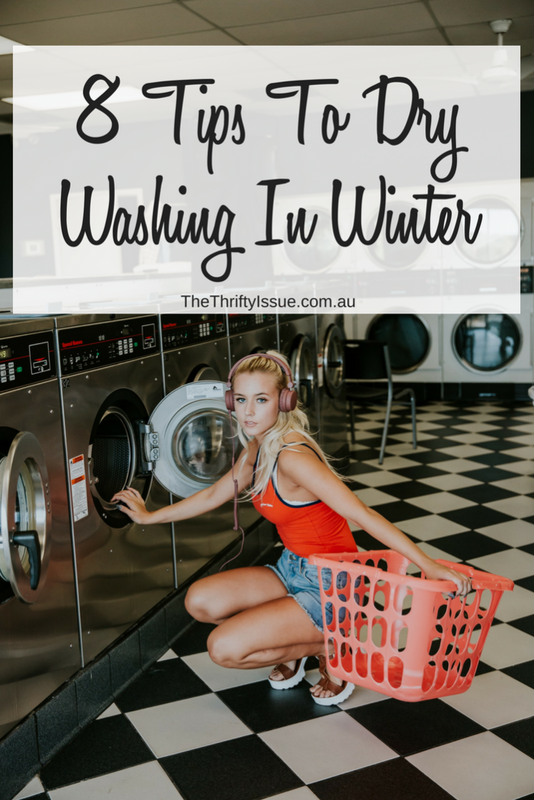 Items such as jumpers, jeans, coats etc are often overwashed. We tend not to get as sweaty in winter so some items may not need washing straight away. This also reduces the wear and tear on your clothing, making them last longer. I tend to wash too often, other friends make their clothes last a few wears. If you do need to use the dryer throw a dry hand towel in or get dryer balls. They help reduce drying time, saving you on electricity. Or, dry your clothes on the lines for a while, then pop them in the dryer to finish them.